Regt: Private 1956, 1/4 Batt. Border Regt., attached to Oxford and Bucks. L.I. Herbert was the youngest son of Patrick McCumiskey, from Dromintee in Ireland, and Charlotte Hudson of Carlisle; they were married in 1873. Patrick was shown in various censuses as a marine store dealer, with premises on Collier Lane. The 1882 Cumberland Directory describes the business as “wholesale and retail dealers in rags, ropes, scrap iron and all kinds of old metals, skins and glass bottles“. In 1909 they moved to the Crown Works on Crown Street, the big five storey building which was until recently Carlisle Glass, and before that William Coulthard & Co. They must have done well, as there is a record of Herbert going to Canada in 1912 on a business trip; possibly to do with the skins (ie furs) they dealt in. His brother Arthur also went to New York the following year on a similar visit. Before the war however, Herbert was working as a bank clerk in the London Joint City and Midland Bank, Carlisle. There were eight children in the family, five boys and three girls. A boy and two girls died in infancy. Their mother Charlotte died in 1908. 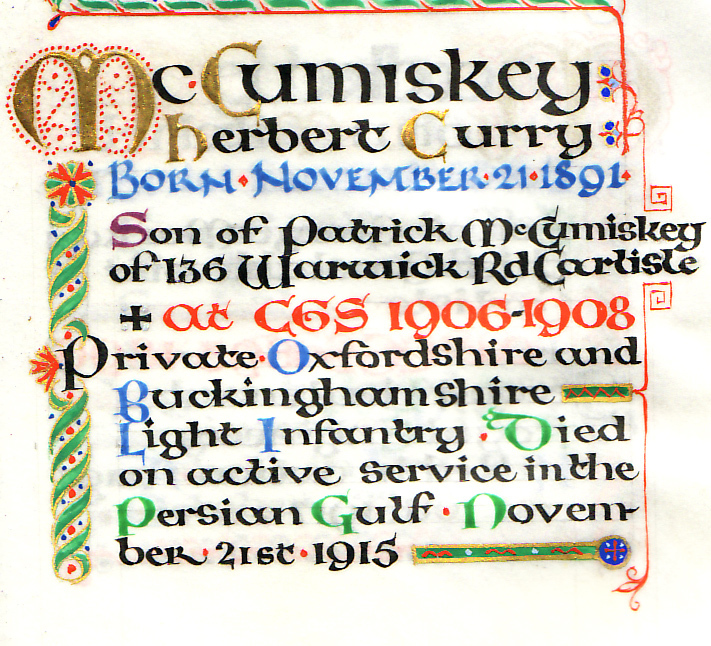 Herbert’s brother Arthur died in 1921 at the age of 40 of meningitis, and in 1923, the eldest son George Patrick McCumiskey, died. 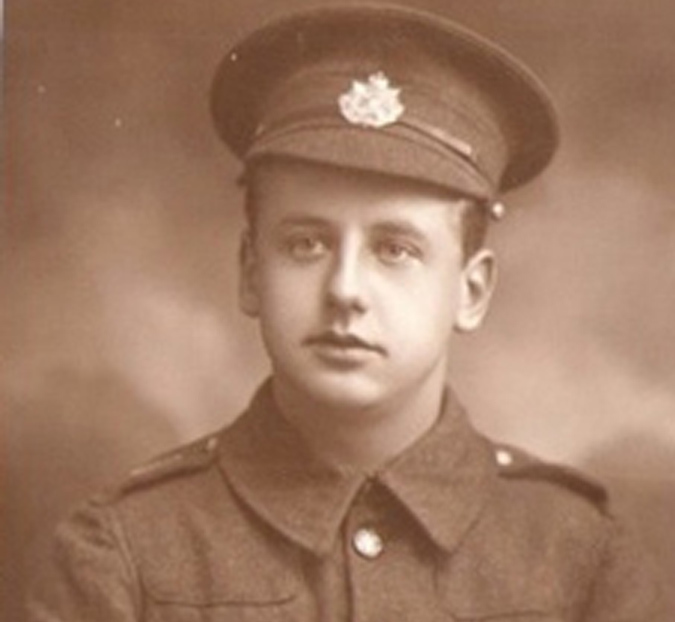 George had also attended Carlisle Grammar School and had also joined the Border Regiment. He had come back from the war with shell shock and never recovered. The family business was finished as a consequence, and the Crown Works were sold to Coulthards in 1924. His war medals went to Perth Australia with his grandson John Alexander but were sold at auction in Sydney in 2009. Patrick died in 1929. Herbert died in 1915, (the day after his birthday), of beri-beri and jaundice, whilst in Mesopotamia (now modern day Iraq). Although his exact grave is unknown, he is commemorated on the Basra Memorial, his Bank’s memorial in Canary Wharf, London and also in Carlisle Cemetery. The Basra Memorial was moved by Saddam Hussein in 1997 to a site 32km north of Basra. The 1/4thCumberland and Westmorland Battalion arrived in India in December 1914. In August 1915, a detachment under Lt Wilson was sent to Mesopotamia for service. Herbert was part of this small detachment that transferred to the Persian Gulf. Football fans may be interested to know that Herbert’s brother Arthur was one of the first shareholders in Carlisle United. The eldest brother George Patrick signed the certificate as secretary, and he also acted as one of the first managers, although he does not get credit for this in the official history of the club.